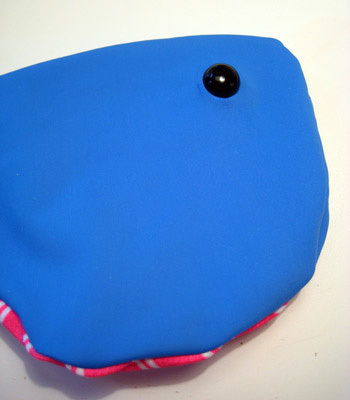 For many stuffed animals and plush, a simple way to add character and cuteness is to use plastic safety eyes. These eyes are installed before stuffing, and the two-part mechanism prevents the eyes from falling off and becoming a choking hazard. They are quite easy to use, but it can be a bit confusing, so here’s a tutorial to help you install plastic safety eyes on your plush! These are the tools you need: small, sharp scissors (the pointier, the better! ), a pin, your safety eye (two pieces: eye and washer), and your unstuffed plush. First, lay your plush so it is completely flat. 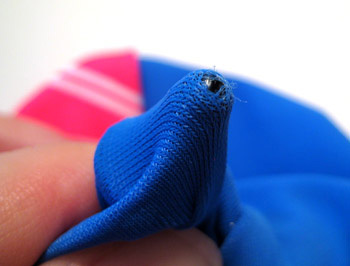 If there is a seam between where you want your eyeholes to be, fold it on the seam (as shown). If you don’t have a seam, fold it at the center. Our goal here is symmetry; we don’t want our little guy to end up with lopsided eyes. 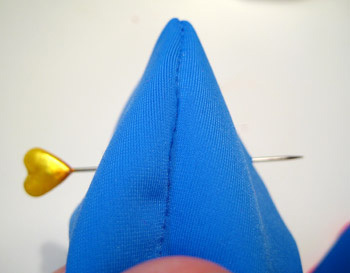 Once you’ve got a fold, decide where the best spot for an eye will be, and stick your pin straight through both pieces. 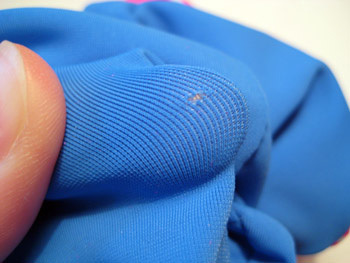 Here you can see that the pin is going through both layers of fabric. Check to make sure the pin is coming out the other side symmetrically to your first hole. Now you want to “puff up” your plushie. 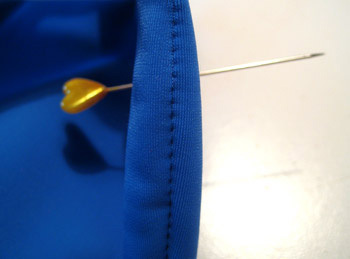 Make sure the pin stays in both sides, but pull at the fabric a bit so that the two sides aren’t touching each other; when we start cutting holes, we don’t want holes in the other side! 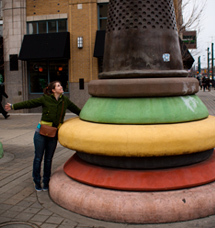 This part was hard to take a picture of because it requires two hands to execute, but this should give you the idea. 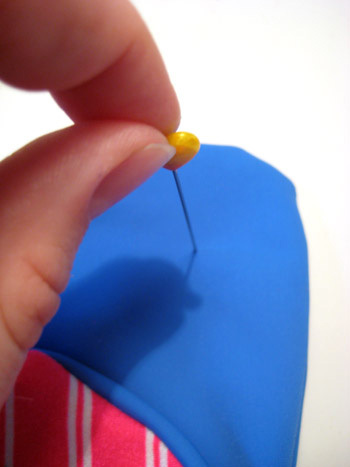 Make sure you’re only cutting through one layer of fabric, and just snip one or two threads around the pin. REMEMBER: You can always make a hole bigger but making it smaller is much more difficult! In this example I am using super stretchy lycra, so I only need to snip one or two threads before my hole is big enough for the eye to slip through. See how small it is? And this will do just fine. The smaller the eyes you are using, the smaller the hole you need. 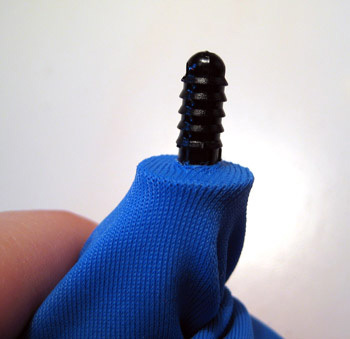 If your fabric is very stretchy, the hole can be tiny and it will work fine. 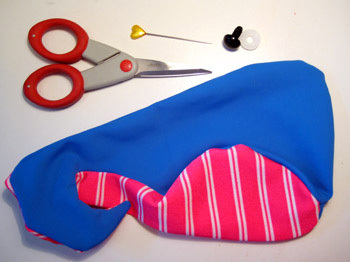 If your fabric is not stretchy at all, I recommend cutting an “X” shape – just two snips crossing each other. Cutting an actual circle will compromise the structural integrity of the fabric. 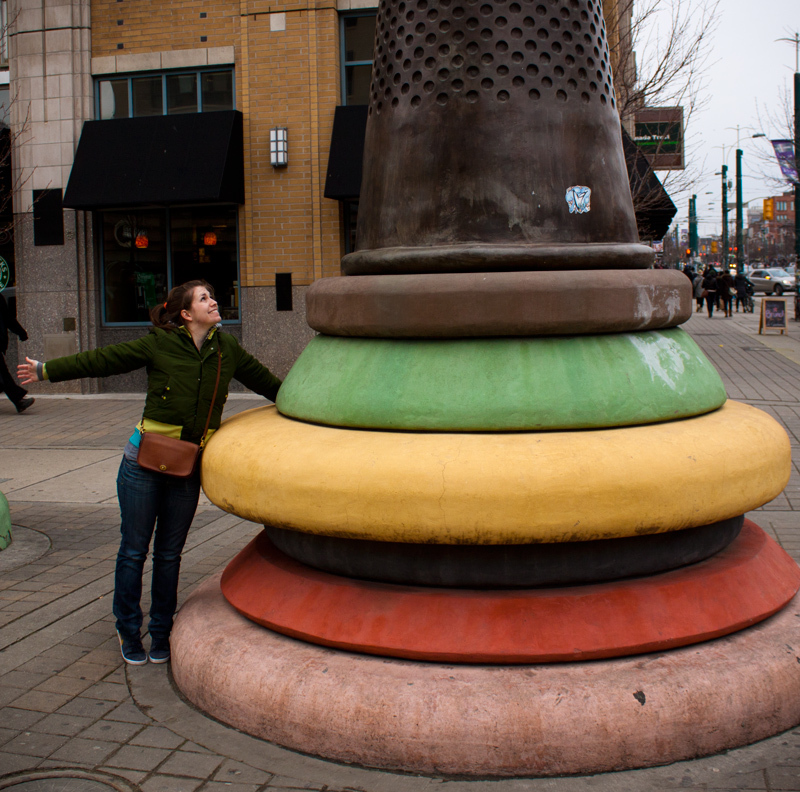 Now stick your eye in. We are looking at the wrong side of the fabric in this picture, so of course the actual eyeball is on the good side of the fabric. If, even when you stretch at the hole, it is still too small, a few snips at this step can help you along. Then, just pop it through! Now we stick the washer on. You should notice that one side has a few (usually 4) little sharp pokeys. You want these facing DOWN when you stick it on the eyeball rod, as pictured. 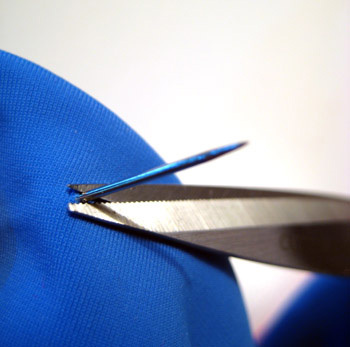 They will help secure the eye to the fabric and keep it from slipping. Now you need to push the washer down. This cannot be undone, as that is the purpose of a safety eye, so make sure you’re definitely where you want to be (even though you’ll be stuck with a hole in your fabric if you go back now!) These can be tricky to push down, so I usually stick my left thumb underneath the eyeball against the right side of the fabric, and use my other thumb to push the washer down. It usually goes one click past what you think it should. If you look at the picture, that is what it looks like all the way down. There will be a slight gap between the fabric and the washer because of the little pokeys. And you’re done! Your little guy is ready to be stuffed and all stitched up, and he’s safe for play with children of all ages. This isn’t entirely foolproof, so do keep a watchful eye on little ones with any toys with eyes. Oh, thank you SO much! Every other tutorial I found on this subject used a knitted or crocheted item to put the eyes on, but mine’s fleece, so your detailed instructions on dealing with various fabrics is PERFECT! Just so you know, those safety eyes are not safe for children under 3 yrs of age. They shouldn’t be called safety eyes. That’s awesome, I never even knew these safety eyes existed. I sew but have never done dolls and I am now inspired after seeing this and also you adorable vintage looking boy doll. Hi Stacy – that’s not a dumb question at all! I’ve been thinking it over and am trying to figure out the best solution for you. I’d definitely start by making sure the hole won’t fray any further than it may have already, because you don’t want that hole to get too big! It should work to just mix 50/50 elmer’s glue and water, and use a toothpick or something to dab it just on that very edge to lock the fibers in place. Clear nail polish would also do the trick. The thing about safety eyes, as you can see in the picture, is that they really have to be installed before the plush is stuffed and sewn up. I think you’re right – you don’t want to try and jam a washer in there. It would be hard to get enough pressure behind the washer for it to snap on, plus who knows if you’d be able to find one that’s the right size. Honestly, if there’s a good amount of flat area on the back of the eye, your idea of gluing it on is probably a good bet. I don’t know how old your daughter is – so just make sure she wouldn’t choke on it if it fell off again. Another solution (and this one’s getting a bit out there) but you could try and jam some air-dry clay into the hole, almost to try and form your own washer. If you just stuck a little blob in there, and shoved the eye into the blob, and then the clay dried, it might help hold the eye in place. I’m thinking Model Magic might work, since it’s super lightweight and dries quickly in air. Sorry I don’t have an “expert” solution for you! But definitely start with some fray-proofing on those edges. From there, I think it’ll just have to be finagled into place. Good luck! Feel free to come back if you have more questions. 1. If you have this interchangeable screw driver set in your house, there is always a handle with a hole, use that to help pushing the washer towards the eye. It’s easier on your hand and you can grab the handle and use a little force and the washer should be right in. 2. 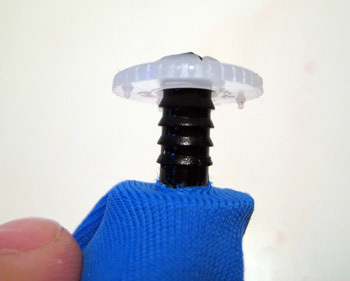 If the washers are too hard, you don’t have the right tool with you, you can soak the plastic washers into a bowl of really hot water for a few minutes. 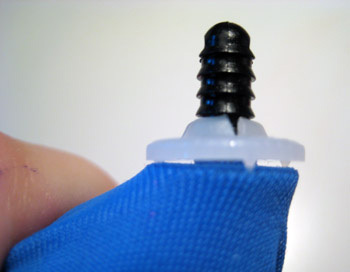 The hard plastic will turn softer and you can dry it and at once push it towards the eyes. 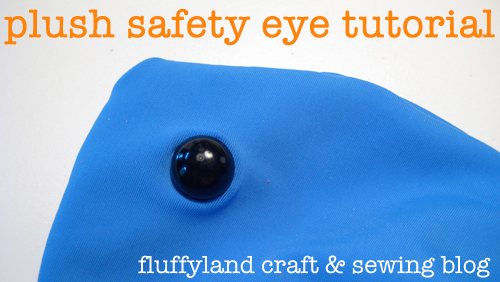 I have been sewing for over 60 years and bought some packs of these safety animal eyes to make some toys. I was surprised to find NO INSTRUCTIONS at all on them.I found your site and now I know how to do them. Thanks for the instructions. Thank you so much for this tip, Brian. After my order of eyes arrived, I found that I couldn’t get the back to go on. I contacted the seller and he said, sorry, I should have told you that you need a tool. Very frustrating since it took 4 weeks for the eyes to arrive, not the two weeks stated. I have a project that needs to be done right away, so another 4 weeks + more money won’t do. I’m going to dig out my screwdriver and give this a try. Wish me luck! I am making a raggedy ann doll and using broadcloth for the body. Do you recommend I put another heavier piece of material under the broadcloth to reinforce the eyes before I attach the eyes so it does not pull through the cloth? Yes, I would recommend adding another piece of fabric. Not only will this prevent it from pulling through, but it will make sure you can’t see the outline of the washer through the fabric. A scrap of fleece or felt would be ideal (something soft), but another layer of broadcloth would be fine, too. Good luck! It sounds adorable! Thanks for your simple tutorial. It was just what I needed. I couldn’t remember which way the washer was supposed to face. How do you replace it if it pops out? I’m sorry :( I hope I’m not causing trouble. Hi Sophie! You put the eye on before you stuff the animal, so the “peg” side of the eye will be on the inside with all the stuffing. Does that make sense?